Are you a NASBA CPE Sponsor? SimpleCert is the solution to your CPE submission requirements. The idea and concept of SimpleCert was born from the need to find a simple solution to creating certificates of completion for Group Internet Based programs. While many of the webinar platforms now have a way to create certificates, they don’t have the ability to store them or have them conveniently located in one place. 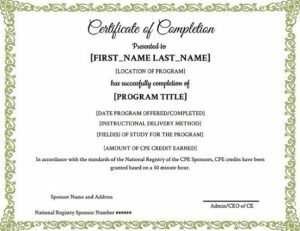 As a NASBA CPE Sponsor, you can use, create, and access SimpleCert for each of your CPE program certificates. SimpleCert automatically keeps required records of participation, dates, and number of CPE credits earned, all within a single management system. However, the best part of SimpleCert might actually be how it supports you and your certificate recipients after credits have been awarded. With SimpleCert’ s flexible subscription plans, you can choose how to manage your CPE Program. Our monthly subscription plans provide you with a custom branded portal for your participants to log in and access all their certificates in one place at any time (even after the event). This plan also allows you to export your program certificates and recipient lists together to keep for your five-year retention requirement. Or you may want to select SimpleCert’ s Pay-As-You-Go plan, which still allows you to access to re-send past certificates and track distribution, but does not require a monthly commitment from you. Don’t want to commit to a SimpleCert subscription until NASBA approves your program? No problem! Use your monthly free credits to create the certificate that needs to be submitted with your application. Just follow their guidelines here: https://www.nasbaregistry.org/__media/Documents/GIB/GIB-Certificate.pdf. We even have a free certificate template with the necessary required elements listed available for you to use.